On November 14, Eastern District of Pennsylvania Judge Anita B. Brody issued an order staying payment of 17 monetary awards to retired NFL players pending the outcome of an NFL appeal; her decision, however, stands to impact every single claim filed in the concussion settlement, moving forward. In order for a court to grant a stay or preliminary injunction four factors must be taken into consideration, as Co-Lead Class Counsel Chris Seeger stated in his opposition of the NFL’s motion to stay. In making his case, Seeger further cited Deflategate precedent in the Second Circuit, emphasizing the likelihood of success on the merits. In a footnote in her order Judge Brody acknowledged Seeger’s arguments. 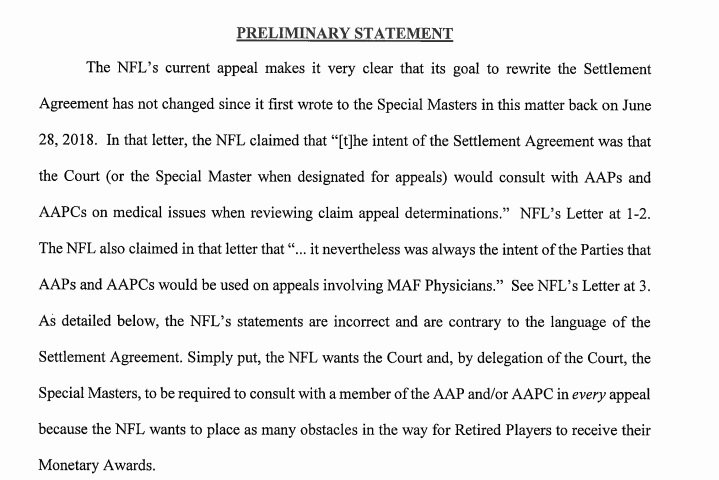 “The NFL has no colorable argument under the plain language of the Settlement Agreement for its objection… the NFL argues that the standard governing diagnoses under the MAF does not say what it plainly says.” Seeger correctly states, regarding the merits, and this makes Judge Brody’s stay even more concerning. Does she feel the NFL has a good chance of success on the merits despite their arguments contradict the plain language of the settlement agreement? It’s hard to predict how Judge Brody will ultimately rule. As I’ve stated in the past, she’s generally viewed Seeger’s arguments and recommendations favorably, but in this exception to the rule, she rejected his opposition to a stay. One attorney that I spoke with said he thought it would be unlikely that the judge would reject the opinion of her Special Masters. That’s a good argument and one that I hope will hold but appeals of Special Masters decisions are supposed to be de novo, or from the beginning without consideration as to previous judicial determination, so this will boil down to Judge Brody’s assessment of the legitimacy NFL’s claims. The NFL has worked aggressively for nearly two years to portray massive fraud on the part of doctors, lawyers and players on mostly circumstantial evidence, so one must wonder if their relentless approach has been successful in influencing the single most important person in the settlement – the judge with final say in settlement interpretation. If you’re reading about this for the first time and feeling totally lost as to what the NFL has appealed and why a stay has been issued freezing payment of 17 specific claims (and also determination of countless other future claims) I’ll refer you to some previous articles in which I’ve covered the motions leading up to the stay in great detail. Recent Non-Public Documents Reveal NFL’s Latest Scheme to Screw Players Filing Dementia Claims (August 31, 2018) – This was written after I first became aware of the NFL’s formal objection to settlement Special Masters decision not to consult AAP (appeals panel physicians) as mandatory and necessary in determining awards stemming MAF diagnoses. Fraud Investigator To Be Appointed for Concussion Settlement At NFL’s Request (September, 14, 2018) – This is unrelated but potentially relevant. Players’ Attorneys React to NFL’s Attempts to Sabotage the Concussion Settlement (September 16, 2018) – Here I detailed the responses of attorneys Chris Seeger and David Langfitt to the NFL’s objections and solidified the argument that the NFL is attempting to rig the settlement against the players it was designed to benefit despite their acknowledgement of cognitive impairment. Concussion Settlement Retirees Escape the NFL’s Latest Ambush…For Now (October 12, 2018) – I reported the Special Masters’ decision in favor of the players regarding mandatory AAP review and expressed cautious optimism as I recapped some of the claims that survived the NFL’s attack. This decision is one of two that the NFL has appealed. Special Masters Ruling on ‘Generally Consistent’ Opens Door for Cautious Optimism for NFL Concussion Settlement Claimants (October 22, 1018) – This is the second Special Masters ruling currently appealed by the NFL. The stakes could not be greater for players in how Judge Brody will ultimately decide the matter. If she should abandon the bargained “generally consistent” standard agreed to and included in the Settlement Agreement, nearly every pre-effective date claim and post-effective date MAF (and possibly BAP) claim which presents a qualifying diagnosis for Level 2 or 1.5 Neurocognitive Impairment (dementia) or Alzheimer’s disease is potentially in peril. Will the NFL’s latest appeal blow up the Concussion Settlement? (November 8, 2018) – This one’s a dive into the NFL’s appeal of “generally consistent,” and how a ruling in favor of the NFL would be the equivalent of dropping an atomic bomb on players’ claims for settlement awards. The remainder of this report will focus on the arguments players’ attorneys have presented in opposition of the NFL’s appeal arguments regarding discretionary versus mandatory use of the AAP. On November 13, Co-Lead Class Counsel Chris Seeger responded to the NFL appeal of an Special Masters which seeks to make use of the AAP mandatory, emphasizing that what the NFL attempts to do is a re-write of settlement terms. One of the “technical medical issues” brought to light in David Langfitt’s earlier brief revolved around a player’s marital status and whether his partner was a girlfriend or a wife. Obviously, the NFL merely wanted another bite at the apple to see if they could find an AAP doc who might agree with them, disagree with all the others, and kill the claim. 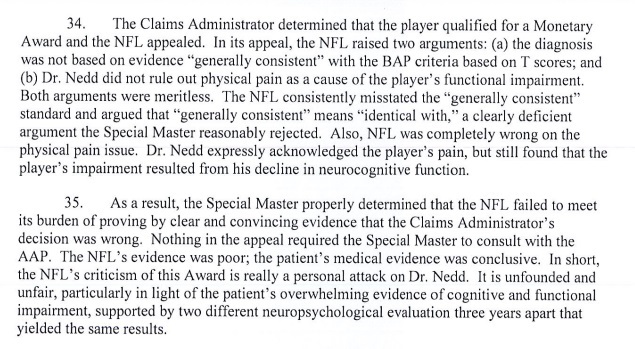 The NFL also disagreed with the decision not to consult AAP when a player who was examined by a MAF doctor dated his impairment to when he was found to be disabled by both the Social Security Administration and NFL Benefits Plan in line with settlement terms. Often the “technical medical issue” is that the NFL found pictures of the player somewhere on the internet in which he didn’t appear to be an invalid, which isn’t supposed to be a requirement for compensation by all interpretations of the Settlement Agreement aside from the NFL’s rendering. The NFL, regardless of the appeal, hangs on “technical medical issues” such as these. “While the Parties have the right to appeal from a Notice of Claim Determination, no Party has the right to ‘appeal’ a Special Master’s determination,” Seeger states in the brief, showing how the illegal appeal is couched as an objection to a conclusion of law, rather than factual question. This is a very important distinction. 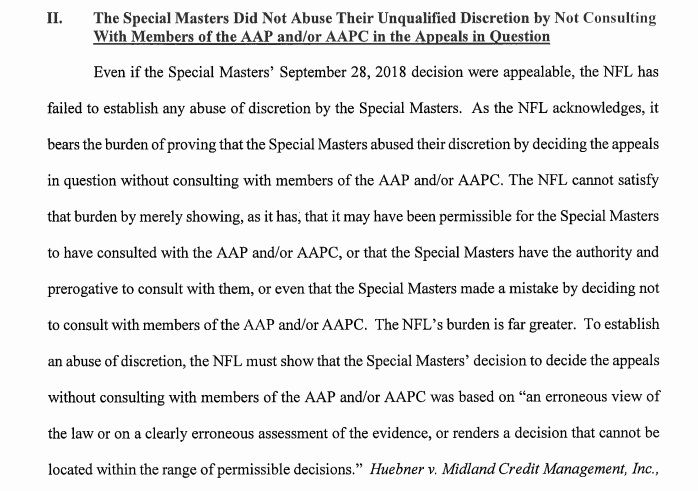 “Despite the fact that the Special Masters’ decision was not appealable because it was not a conclusion of law (which would have been appealable under the Court’s July 13, 2016 Order appointing the Special Masters), the NFL now seeks to appeal the Special Masters denial of their objection, arguing that the Special Masters abused their discretion by not consulting with a member of the AAP and/or AAPC,” wrote Seeger in his brief. According to the settlement, a determination of fact on the part of Special Masters is not appealable—only conclusions of law. In this respect, settlement interpretation by order of the court is already being rewritten in allowing this appeal to proceed. In view of this illegal appeal which has already gained a stay order from Judge Brody, the implications for the players and the integrity of the settlement are troubling. Considering Seeger has supported the NFL positionally in the past, his words on this issue, in opposition of them should be viewed as an exceptionally strong statement. There is an enormous volume of case law to support Seeger’s argument. Long-time readers might even find this argument reminiscent of the Second Circuit opinion in the Tom Brady Deflategate appeal reflecting the NFL’s own arguments in that case. While the Deflategate case centered on labor law rather than a court-approved class action settlement, both a CBA and a settlement agreement are contracts that must be interpreted and maintained. In the Deflategate case, the arbitrator was positioned to interpret and act within the bounds of the collective bargaining agreement. In this, as most mass tort settlements, the Special Master would serve an equivalent role in interpreting the settlement. There is absolutely no mandate in the settlement requiring Special Masters to consult the AAP outside the provisions of §6.4. I would assert that the Special Masters are capable of seeing through legal posturing and determining for themselves when consultation is needed or desired, and this is precisely what has the NFL upset. Section 9.8 of the settlement agreement also confirms that the Court (or by designation of the Court, Special Masters) “may be assisted in its discretion.” Is this unclear? Are the white-shoe law firm attorneys representing the NFL unable to read at a fourth-grade level? I hardly think so. Instead, they seek to rewrite the settlement with more favorable terms to their client NFL in violation of every fundamental principle of law. It’s hard to imagine how Judge Brody could see this differently; perhaps her stay was issued on the NFL’s claim of “irreparable harm,” because it seems a stretch that she could even consider the merits of their appeal as any reasonable construction of plain settlement language. I love footnotes because the devil’s often in those details. In these footnoted details, Seeger reminds the court that the NFL “points to the BAP and MAF as trusted sources for Qualifying Diagnoses,” in their appeals of pre-effective date claims. 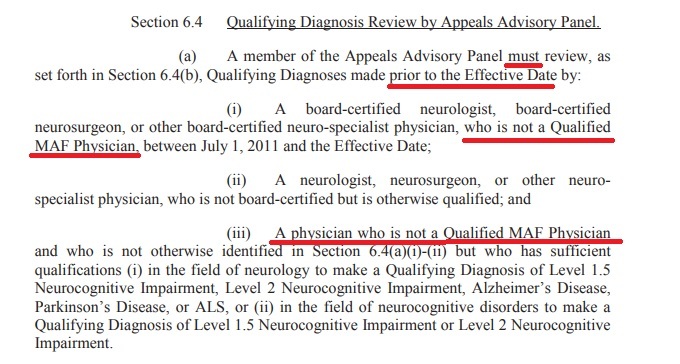 He also points out that when claims determinations are made, both parties have a right of appeal, but here, the NFL seeks to usurp on this right and appeal determinations of Qualifying Diagnoses by a MAF or BAP doctor, which a player has no ability to do. If a player even had the ability to do this and sought a different diagnosis from a different doctor, he’d be accused of doctor shopping, and the NFL in fact, has even gone so far as to make the accusation that players are buying their diagnoses if they choose to see a MAF provider instead of participating in the BAP. Meanwhile the NFL merrily shops for an AAP who will agree with them discarding and discrediting the opinions of the examining doctor, the claims administrator, and the Special Master. If players can’t obtain a diagnosis by following settlement rules and obtaining examinations by doctors approved by class counsel and the NFL as the settlement dictates, then how are they supposed to obtain a diagnosis? It seems clear that the NFL just doesn’t want to pay claims and in order to avoid payment, they must find a way to prevent players from being diagnosed, or somehow discredit the diagnoses that were rendered. David Langfitt of Locks Law Firm, acting on behalf of the 17 players (and their attorneys) whose awards are under attack also responded to the NFL appeal. He re-emphasized many of Seeger’s points including the obvious attempt by the NFL to rewrite the settlement by way of an illegal appeal. Langfitt rightly states that should the NFL prevail, they would obtain the right of “veto power to nullify the clinical judgment of MAF and BAP clinicians” without ever examining a single player. Langfitt also points out that a ruling in favor of the NFL would violate §30.3 of the settlement agreement which prohibits an amendment unless approved and signed in writing by BOTH parties. The court has been especially lenient of the NFL even going so far as to appoint a special fraud investigator at their request. 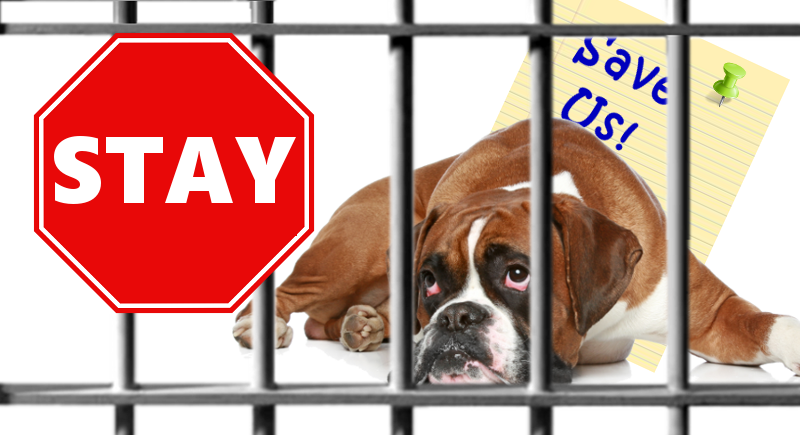 Langfitt reminds the court that existing anti-fraud provisions make sure that only valid claims are paid. “Rather the NFL seeks a new layer of review not within the Settlement Agreement in the hope that AAP will quash valid Awards…scrutinized by the Claims Administrator, scrutinized through the anti-fraud provisions, and affirmed by the Special Master.” He directs the court’s attention to the fact that since the AAP have denied 80% of all pre-effective date dementia claims that the NFL seeks to weaponize them against post-effective date claims as well. Like Seeger, Langfitt points to §9.8 and §30.3 of the settlement agreement and also Rule 22 for settlement administration which he asserts the NFL agreed to in February 2018. “This is the NFL at its most cynical,” Langfitt writes, reiterating the fact that the NFL hopes to capitalize on AAP’s denial of 80% of pre-effective date dementia claims. As I’ve written previously, there is strong evidence to suggest that the NFL has carefully vetted and “trained” the AAP in what they consider a payable diagnosis. The contradiction of NFL counsel regarding the settlement and the NFL’s position in its own 88 Plan for Neurocognitively Impaired retired players, is also highlighted in Langfitt’s brief. In seeking to usurp MAF and BAP physicians who examine patients of their ability to issue a clinical judgment in favor of someone who has never seen or examined the players and relies only on superficial records and the NFL’s scouring of social media to find photos of players in a possible cognizant moment, leave the NFL caught in a web of asserting two diametrically opposite positions. Langfitt’s filing looks specifically at the four awards the NFL now attacks that weren’t a part of their original appeal. This player received a 2.0 diagnosis through the BAP—the NFL’s preferred option. The NFL’s appeal of this man’s claim demonstrates that they do not view any player who has a modicum of awareness as compensable. Most doctors recommend that dementia patients remain active in order to prolong any cognitive ability they may retain and provide some quality of life so that the patient doesn’t feel completely isolated from the world he once enjoyed. This player has faced demotions and has through the grace of his employer kept his job so that he can retain his dignity. Langfitt correctly points out that this is not a “generally consistent” diagnosis but a by-the-book BAP diagnosis that the NFL seeks to discredit. One of the four new players caught up in this appeal received a diagnosis of severe impairment in 2014. He was examined again in February 2018 to confirm the diagnosis. The MAF doctor made the same conclusions as the personal physician who first diagnosed the player. The NFL has appealed this award because they allege his impairment is because of the physical pain he suffers and not neurological damage. The fourth new player in the NFL’s line of attack was diagnosed with Level 1.5 Neurocognitive impairment. Here’s the situation of another player under attack. The scenario above is very typical of the NFL appeals I’ve reviewed. The NFL seeks to rob players who dare to file a claim of every shred of dignity in life they might possibly cling to. Langfitt concludes by asking the court to expedite awards to these players who’ve already experienced inexcusable delays because of the NFL’s malicious conduct and requests that interest be applied to somewhat compensate them for the extreme delay in payment. He further asks the court to order the NFL to pay all attorney fees for the lawyers who’ve spent their time fighting the NFL’s frivolous appeal, specifying this should NOT come from the 5% holdbacks, since that would, in essence punish the players while rewarding the NFL’s reprehensible behavior. Judge Brody stated that she would issue a ruling “quickly.” I’ve noticed that her orders are often issued on Tuesday’s, so it could perhaps land as soon as early next week. I hope she understands the gravity of this appeal, and that players’ lives, the success of the settlement and perhaps her entire judicial legacy are at stake with her decision. May she find wisdom and compassion as she contemplates her position.